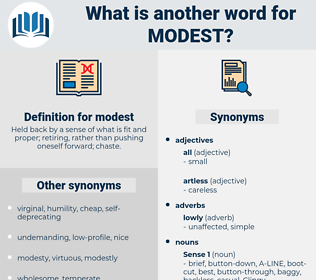 What is another word for modest? Held back by a sense of what is fit and proper; retiring, rather than pushing oneself forward; chaste. 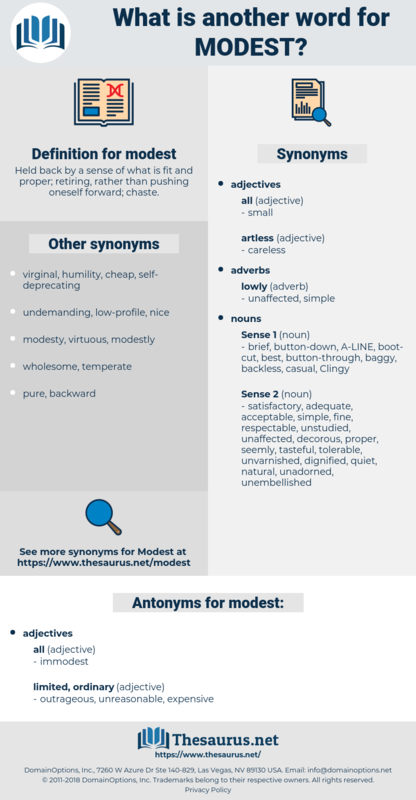 moderate-income, moderated, insignificant, lowly, meagre, small-scale, tiny, cautious, unobtrusive, negligible, scarce, inconspicuous, restricted, weak, gentle, discrete, tenuous, shy, straightforward, proportionate, disappointing, reasonable, decent, reticent, benign, tentative, inconsiderable, narrow, trivial, sparse, slow, light, measured, centrist, reduced, skinny, lenient, soft. smallest, modest-income, timid, mild, restrained, low, mediocre, simple, discreet, minimal, marginal, conservative, scant, lightweight, few, low-key, poor, short, small. courageous, presumptuous, unashamed, unabashed, proud, ostentatious, intricate, extraordinary, arrogant, egotistical, self-confident, complex, complicated, unlimited, brave, bold, assured, conceited. narcissistic, overconfident, boastful, swaggering, sociable, high-handed, obscene, indecorous, smutty, outgoing, tainted, hoity-toity, high hat, self-obsessed, dominating, unclean, limitless, convivial, coarse, extroverted, patronizing, overbold, dominant, immoderate, ribald, condescending, dirty, unchaste, tacky, magisterial, filthy, self-centered, idiosyncratic, braggy, spotted, lordly, boon, forceful, sullied, blemished, highfalutin, private, egocentric, clubbable, pontificating, tarnished, gregarious, uncommon, impure, stained, defiled, unique, uppish, unrefined, peculiar, special, strange, dashing, vulgar, indelicate, social, individual, Fastuous, Self-complacent, unusual, companionable, unseemly, rare, bombastic, self-satisfied, distinctive, improper, soiled, tasteless, crude, high-and-mighty, exceptional. That, no doubt, did give her a modest right to speak. He was modest and reserved. midst, matched, mudcat, mid-august, mahdist, midget, mind-set, mad-dog weed, matchwood, methodist, mendacity, modesty, Mendicity, mindset, medicaid, medicate, medusoid, Mount Shasta, mot test, Mot Juste, modiste, medusa's head, matchweed, monotheist, midwest, manducate, mitigated, matchet, mutsuhito, Manduca Sexta, mitigate, Mideast.